James Spann has the forecast for MLK Day in Alabama from Alabama NewsCenter on Vimeo. FRIGID START: Temperatures at the official reporting stations over north and central Alabama were mostly between 20 and 25 degrees at daybreak with a clear sky; colder valleys were in the upper teens. Look for sunshine in full supply across Alabama today with a high in the 40s over north Alabama and 50s across the southern counties of the state. Tonight will be clear and not quite as cold as last night, with lows mostly in the upper 20s and low 30s early Tuesday morning. MIDWEEK: Clouds will increase across the state Tuesday, with afternoon temperatures rising in the 50s. On Wednesday, rain will move into the state ahead of the next wave in the upper atmosphere. There’s a decent chance we rise into the low 60s Wednesday afternoon, making it the warmest day of the week. Periods of rain are likely Wednesday and Wednesday night, but the air will be stable and there is no threat of severe thunderstorms. Most people will not hear any thunder. As another shot of colder air moves into the state, there is a chance the rain could transition to a period of light snow flurries late Wednesday night or early Thursday, but once again we expect no accumulation or impact. During the day Thursday we project a clearing sky with a high in the 40s. FRIDAY AND THE WEEKEND: A cold front will slip through the state late Thursday night or early Friday, and for now the air looks too dry for any meaningful precipitation. Friday will be partly sunny and cold, with a high between 39 and 43 degrees. Over the weekend, an “Alberta Clipper” type system will approach from the northwest, and it will have the chance of producing some precipitation across the state. Model solutions are not consistent, and forecast confidence is low at this point. 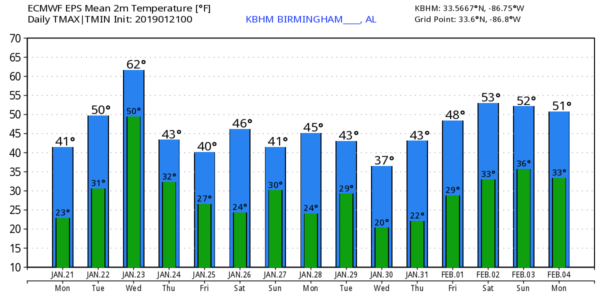 Thermal profiles suggest the air will be cold enough for some light snow over at least the northern quarter of Alabama Saturday night and Sunday morning, but the amount of moisture and the lifting mechanism is very much in question. For now we will mention a chance of light rain or light snow Saturday night and Sunday morning; we will be much more confident and specific later in the week, especially after we get the midweek system out of here. Temperatures will remain below average Saturday and Sunday, with highs mostly in the 40- to 45-degree range. NEXT WEEK: The first half of the week looks dry with temperatures remaining below average. SATURDAY’S STORM REPORTS: The National Weather Service in Birmingham identified four tornadoes on Saturday. The most significant was an upper-end EF-2 that moved through Wetumpka in Elmore County, producing significant damage. That tornado was 18.2 miles long with maximum winds of 135 mph; the maximum width was 700 yards. An EF-1 tornado touched down in Coosa County southeast of Rockford, and other EF-1 tornado damage paths were found in Dallas and Autauga counties.